The air is getting a bit chillier with the coming of Autumn. 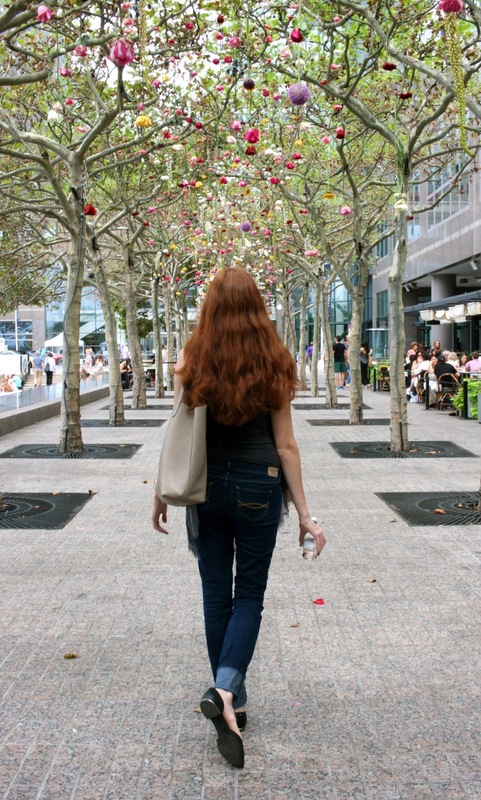 We decided to head into Manhattan and walk around Battery Park/Wall Street/Tribeca. We rarely are in this area. It's more of a tourist destination or work place. If you are around, stop by the Museum of the American Indian. It's part of the Smithsonian, so it's free! We took the drone with us to get awesome views of the city. We succeeded. I kept trying to take pictures of the bees with my new lens. We followed a walk up the west side to the formerly known World Financial Center, now Brookfield Place. It's basically just a fancy mall. Preston and I love it for the palm trees, a reminder of home. It was also a memory for when I first visited New York. It was our senior year field trip. I remember getting off the tour bus and everyone lining up for Starbucks. It's kind of amazing to think that one 3-day trip was the only time I had been to New York before moving 3 years later. And now I have been here 4 years! Time flies. My favourite discovery of the day was this floral ceiling. It was in the process of being created when we stumbled upon it. I could look up at it all day-it was like it was raining flowers!